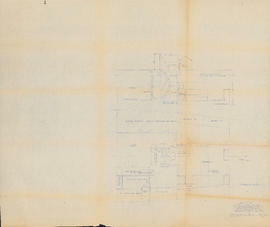 File contains two copies of a drawing of arrangement "B" of the main cabin of an unidentified ship, probably the Bluenose II. The drawing shows the placement of berths, tables, a fireplace, and other furniture. 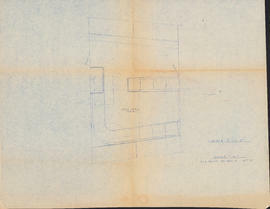 File contains two copies of a drawing of arrangement "C" of the main cabin of an unidentified ship, probably the Bluenose II. The drawing shows the arrangement of furniture in the cabin. 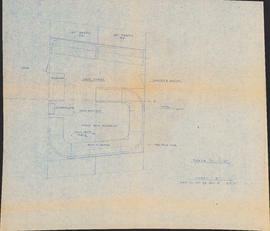 Item is a drawing of top and side views of an unidentified ship, probably the Bluenose II. The drawings show the placement of rooms inside the ship. 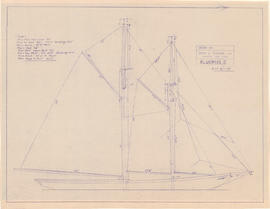 Item is a drawing of a side view of the Bluenose II. 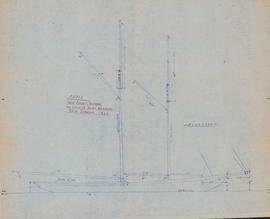 The drawing includes measurements for the masts, boom, and other parts. 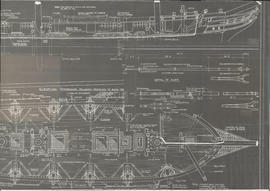 Sub-series contains technical drawings of the Bluenose II.